This has not always been peachy. She maneuvers through mountains and mountains of criticism, hunger (fans volunteer to feed the band before shows and sometimes don’t show up w/ the goods) and most unfortunately, she lived through sexual assault. And yet she keeps going. Her community holds her up, follows through, bolsters her with supportive tweets, hugs after shows, and massive generosity. 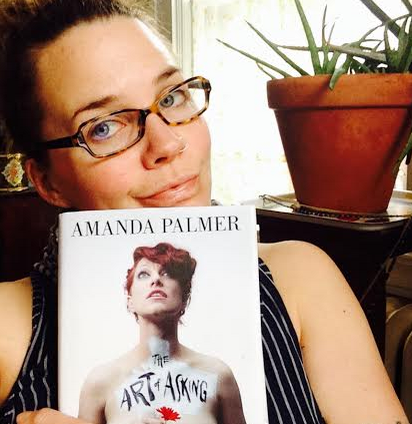 I have so many take-aways from this book … and I must say, the good-vibe-solidarity w/ this memoir and my deepening love for this incredible artist take the cake. These good vibes also morph into nebulous, possibly “woo-woo” reactions regarding love and light, karma and giving, as well as some practical how-to’s to add to the way I live my own life. I will probably not allow my fans to paint my naked body after shows (let’s just let that be Amanda’s amazing signature!) but to “ask without fear,” to believe in the value of art for the sake of art (art is WORTH IT! ), to build relationships through music that go beyond performer/listener but to see the humanity, the loneliness, the pride, the vulnerability, the passion whether flaring or dormant, to demand & foster respect and COMPASSION as we walk the streets each day … this is a book about BIG LOVE. I highly, highly recommend it. … I have a little bit to ask of you 😉 I am also in the middle of a Kickstarter project! Please give it a look and any support you can offer is much, MUCH appreciated! Kickstarter Campaign for my 6th album “Holy Bones” has launched!